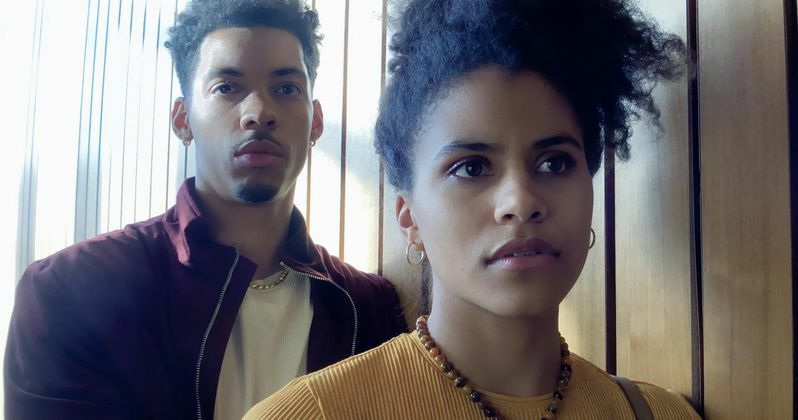 Netflix has released the first trailer for High Flying Bird. In recent years, Netflix has been pouring billions of dollars into premium content, and that has attracted a lot of A-list talent to come and work for them, as opposed to going through the studio system. This represents another major talent who has made the move to the streaming world, as Ocean's Eleven director Steven Soderbergh has made his latest for Netflix. And instead of telling a tale about a heist or male strippers, he's taken on the world of professional basketball. As we see right off the bat, this movie is going to be dealing with the famous NBA lockout, which saw the entire organization grind to a halt. No games being played. No players doing what they're paid to do. No fans filling stadiums. None of it. The drama comes into play when a power struggle is set up between those at the top of the NBA, who control the sport, and everyone else whom they profit from. A sports agent then sees a way to perhaps balance the scales of power which, naturally, doesn't sit well with those currently in power. It's perhaps not the most thrilling trailer, in itself, but it does tee up a compelling narrative. High Flying Bird takes place In the midst of a pro basketball lockout. Sports agent Ray Burke (Andre Holland) finds himself caught right in the middle between the league and the players. His career is potentially in jeopardy, but Ray is looking to up the stakes. With only 72 hours, he has to try and pull off a bold plan, which involves outmaneuvering and outsmarting all of those in power as he uncovers a loophole that could change the game forever. The outcome raises questions of who owns the game, and who perhaps should. Oscar-winner Steven Soderbergh directs, working from a script by fellow Oscar-winner Tarell Alvin McCraney, who penned the Best Picture winner Moonlight. So Netflix has a very solid duo behind the real-life sports drama. Soderbergh actually announced his retirement from directing in 2013 but, thanks to his series The Knick, his love for the craft was re-ignited, which led to him helming the hit Magic Mike. Since then, he's been back, but he's also been trying to disrupt Hollywood. His previous movie Logan Lucky looked to avoid the typical high-dollar marketing spend, an experiment that didn't quite pay off. In this case, he joins filmmakers like Alfonso Cuaron, Paul Greengrass and Michael Bay in skipping a typical theatrical release in favor of going straight to Netflix. The cast includes Zazie Beetz (Deadpool 2), Melvin Gregg (American Vandal), Sonja Sohn (The Wire), Zachary Quinto (Star Trek Beyond), Kyle MacLachlan (Twin Peaks) and Bill Duke (Predator). It also features appearances from NBA stars Reggie Jackson, Karl-Anthony Towns and Donovan Mitchell. Be sure to check out the new trailer and poster below. High Flying Bird hits Netflix on February 8.